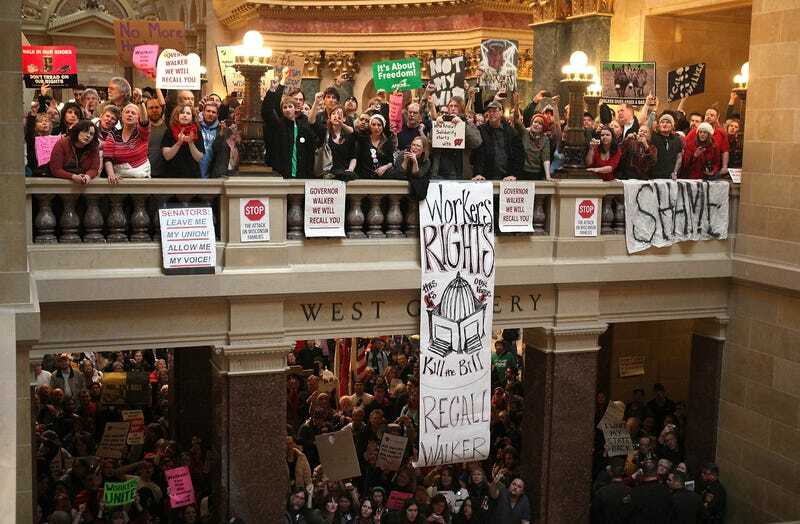 In terrible news for teachers and other state employees in Wisconsin, the state Assembly has passed the controversial bill that curtails most state workers' collective bargaining rights. Yesterday, after weeks of protest against the legislation, state Senate Republicans managed to use a technical procedure to get it through despite the absence of 14 Democrats. Throngs of people upset at the developments have been protesting on the grounds of the Capitol throughout the day. The bill will reach Gov. Scott Walker's desk for final approval. The bill would, among other things, allow public workers to collectively negotiate wages only and bar unions from taking dues from public workers’ checks. Walker has argued the bill is necessary to help the state correct its deficits and avoid massive layoffs and property tax hikes. Follow breaking news on this issue at CNN. In other news: Principal Singles Out Black Males for Test-Score Reprimand.